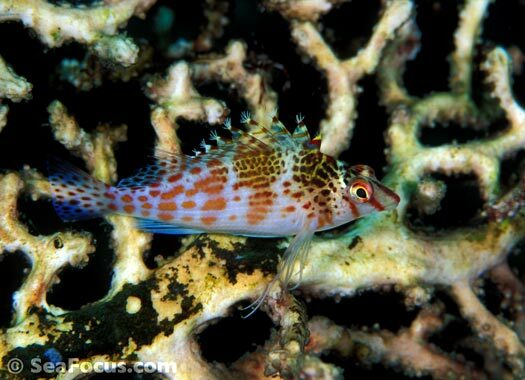 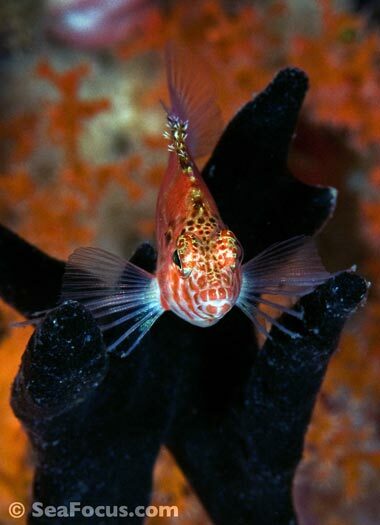 Hawkfish belong to the Cirrhitidae family, which has over 30 different species around the world – although spotting the differences between some of them, especially on a dive, can take some doing. 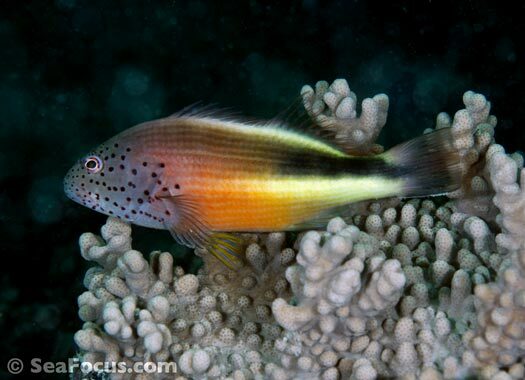 This fish family ranges from 10 centimetres to about 30 long, with the smaller species common in the tropics while the larger ones tend to be found in subtropical, cooler waters. 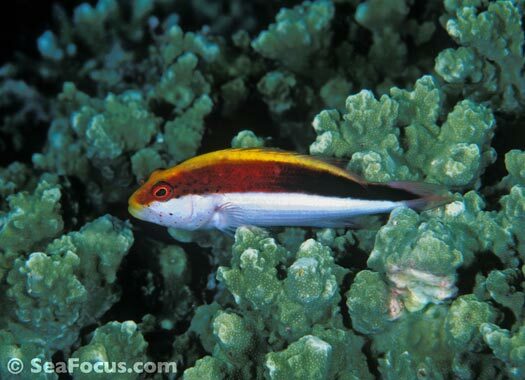 Generally hawkfish are shallow water fish, rarely found deeper than thirty metres. 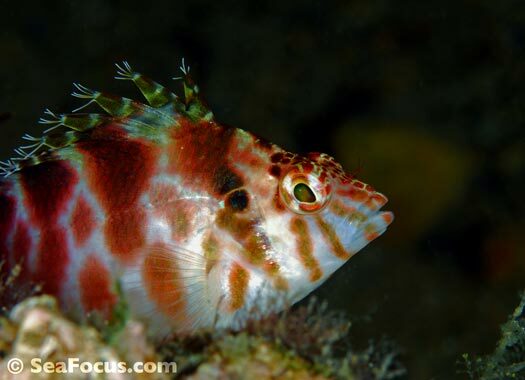 With a small, stout body and comparatively large head, their distinguishing features are all to do with colour and pattern: spots, stripes and freckles. 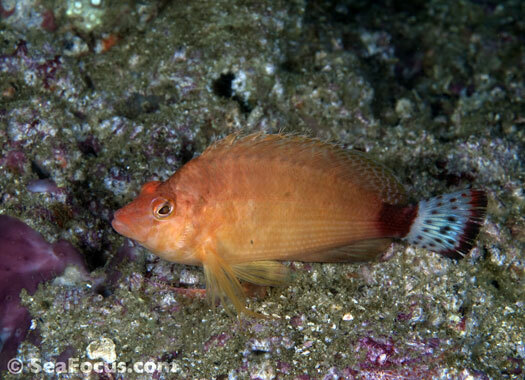 They all have tiny frills (or cirri) on their dorsal fins and just behind their nostrils. 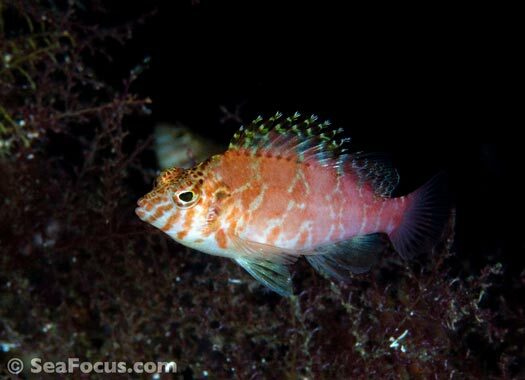 Hawkfish get their common name from the way they sit completely still on the reef, then swiftly swoop down on a suitable prey as it passes by. 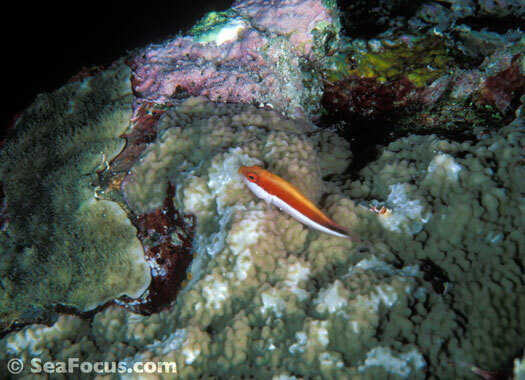 This is due to their lack of a swim bladder, the organ which allows them to hover in the water column. 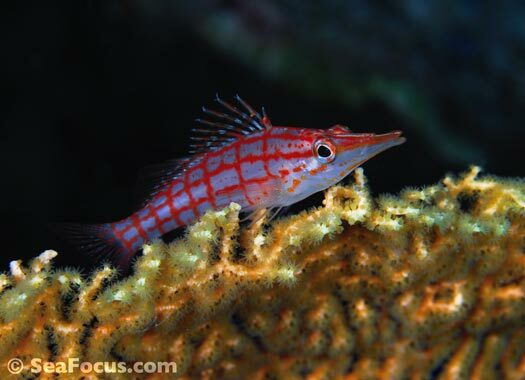 This means they will sink when they are not on the move so spend their days perched on a favoured piece of coral or other part of the reef, anywhere with a pattern or tone that matches their own and affording them some camouflage. 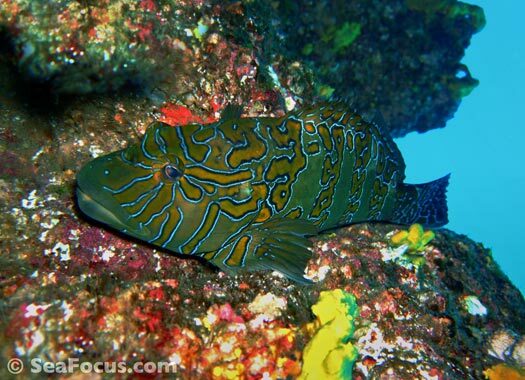 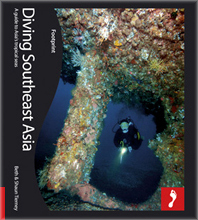 At Fiabacet channel, there are two tiny rock islands that protrude from the sea, As you descend, you see that beneath the surface these are connected by a saddle of coral clad reef. 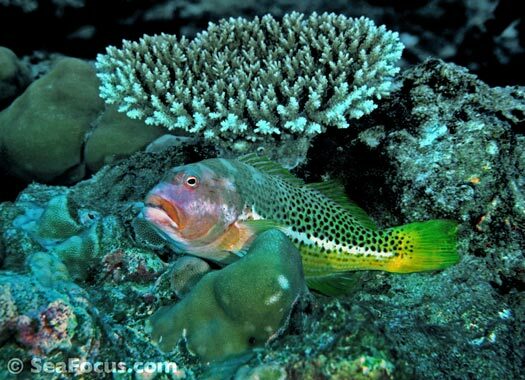 There is a small pinnacle in the middle of the saddle that is covered in corals and fans and although a light current swishes around it, the site has a lot of macro life. 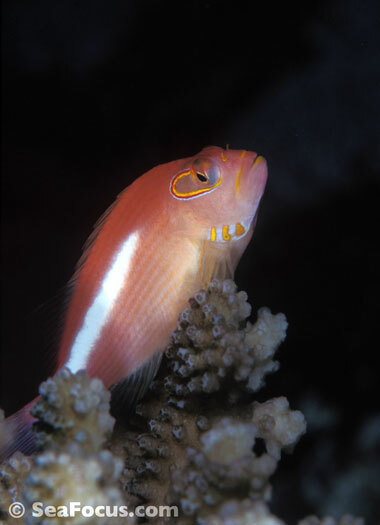 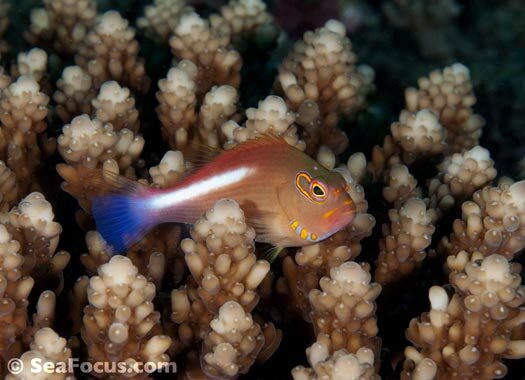 This threadfin hawkfish caught our attention as he was sitting is such an exposed position, very unlike them as they are nearly always nestled into the reef for protection. 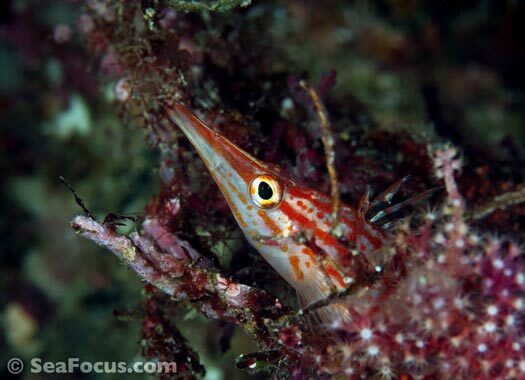 This protruding sponge must have been handy place for spotting prey as although he swooped away when we disturbed him, he quickly returned when we finned away.